First off, let's define cohorts and cohort analysis. Cohorts are customer segments separated by time. The customer segments are usually grouped based on behaviour or other qualifying factors that determine the group into which they are placed. Cohort analysis takes these segments and analyses them for trends and discrepancies over time. They're very useful for ecommerce analytics; for example, when you want to see churn rate over time, revenue per visit or average order value. You can't add new users once you've started making your cohort analysis but you can look at historical data over months about certain groups of current users. 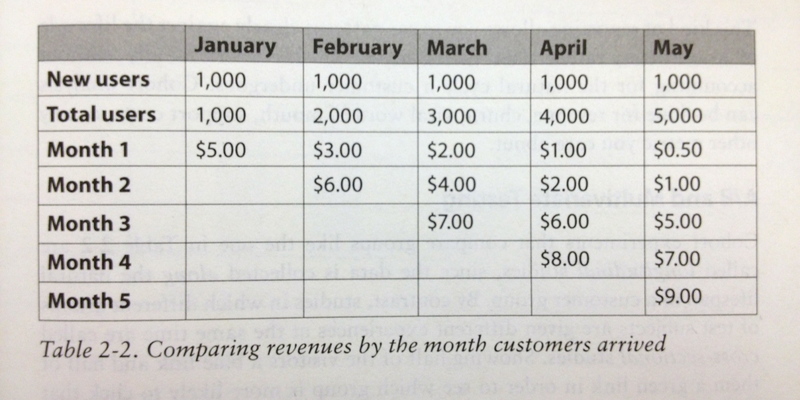 The chart above is from Lean Analytics by Alistair Croll and Ben Yoskovitz. Their second chapter on metrics covers all types of comparative analyses, with cohorts being a very important one. As they explain, a major benefit to using cohort analysis is that it will separate growth metrics from engagement metrics, which can diverge during certain stages of the customer lifecycle. Companies commonly make the mistake of focusing on their steady revenue growth while they are unknowingly losing engagement or repeat customers; cohort analysis will reveal the actuality of your companys growth and engagement separately. For instance, subscription etailer XYZ wanted to know whether growth in Average Order Value was a direct sign of marketing campaign ROI, or other factors. After performing cohort analysis - where they divided up subscribers by month - they found that older subscribers were spending less, but because new ones were spending more and masking the smaller spenders, they would never have spotted this discrepancy. In order to ensure that their existing and older customers stayed engaged and spent more, they allocated further resource to marketing, retargeting and discount CTAs on their homepage. The confusion caused by generalised metrics that take all users into account is a common situation that only becomes clear when carrying out a cohort analysis.